I’m so excited to continue on with part 2 of discovering your signature style. In case you missed part 1, head over and read that first before continuing here. Over the past month we’ve been working on honing in our style as a couple and I’m so excited to share with you all about it, but first I want to show you where we’re starting out. Today is all about my husband’s style. Here’s a little background. Justin is a graphic designer. He went to a liberal arts school and he designs smart phone apps for a living now. It’s a pretty sweet gig! I believe art school ruined him in a way…or maybe it just gave him a chance to figure out what he loves. Either way, his style and my style are nothing the same now. He loves a combination of the super modern, contemporary pieces like Frank Gehry does, but then throw in a mix of the funky prairie-style feel from Frank Lloyd Wright. Prairie-style houses were designed to blend in with the flat prairie landscape. The typical prairie-style house plan has sweeping horizontal lines and wide open floor plans. Google it if you don’t know what I’m talking about. So not my look! 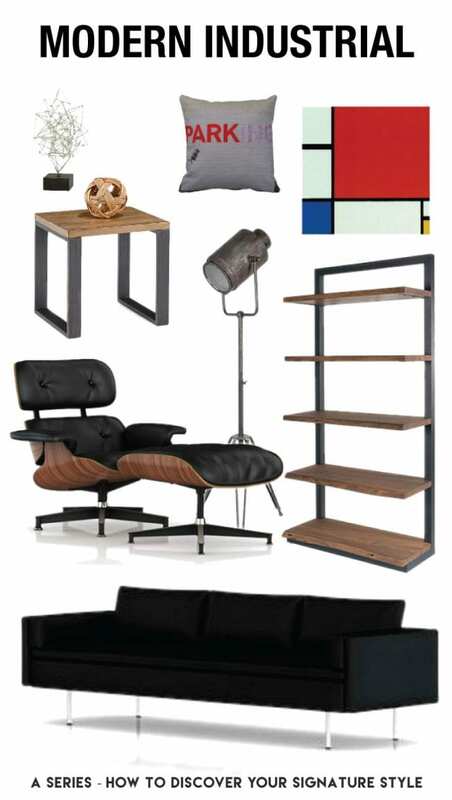 If it was up to Justin our home would be filled with leather sofas, Eames chairs, and industrial metal pieces. But enough of what I think his style is…I’ll let him just show you. Yes, I was able to convince him to pin his dream home on Pinterest so that I could share with you exactly what he loves. And lucky for you, I’ve provided links for your convenience so you can check them out. This is literally his dream style and it’s been hard trying to figure out how to combine my cozy contemporary with his modern industrial into a cohesive look. Currently, the modern industrial light we built, an industrial-style desk, and black leather couch are tucked away in his office. Now we’re finally starting to blend our two styles and I’m so excited with our new direction!! Check back next week for part 3 in this series to see our new style! For the first time in 8 years we’re agreeing on a look and not feeling like one of us is always compromising. Do you love the modern industrial look? I like it but I certainly don’t want it filling my home.